Sometimes, you want to make people think they are being recorded, to help discourage poor behavior. The F-100 fake security camera is ideal for these applications, it has built in flashing light and side to side movement when motion is detected in front of the camera. 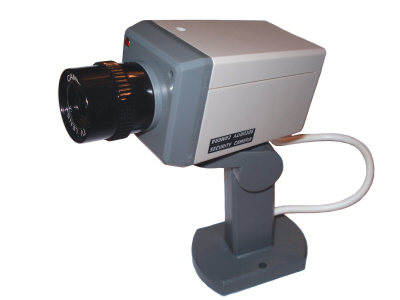 These cameras are designed to look like a standard C/CS mount security camera, and has even been used in many movies when they want to show security cameras (for instance, take a look during hospital scenes of Resident Evil). These fake cameras can help you improve behavior of employees and customers, without having to put an actual camera in place. Camera accepts batteries (not included) for light and motion power. Fake cables extend from teh fake camera, to run above the ceiling or through the wall to simulate actual security camera cabling.